Ah salad dressing - the quickest way to make your healthy vegetable platter into a monstrosity with more calories than fried chicken with biscuits. 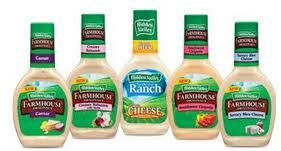 If you have to have a dressing on your salad, go for the balsamic vinaigrette, and get the dressing on the side. Here's a good example, if you eat the Caesar salad with the normal amount of dressing they provide (about 3 servings) or heaven forbid, you should get extra, you have just added approximately 600-800 calories to your dinner salad! That is more than a Big Mac at McDonald's. It's just a little sandwich spread right? Yes, a little sandwich spread with 90 calories per tablespoon. A typical Subway sandwich typically has 3-4 tablespoons on it. 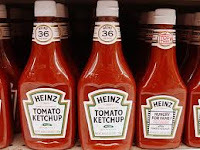 If you are looking to keep your weight down, avoid this treacherous condiment. It shocks me that people tell me that they want to lose weight but then also say they won't trade in white bread for whole grains. 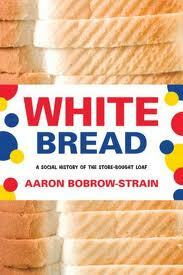 White bread causes a rapid spike in blood sugar that, when repeated unnecessarily, can lead to obesity, heart disease and diabetes. It's a pretty simple step, and if you genuinely want to lose weight and improve your health, changing to whole grains is a must. I think that people know that soda is bad, they just like the taste. However, drinking a few sodas a day is adding hundreds of calories to your diet. If you drink two sodas a day, you will be on track to gain a pound a week just from the soda! Ketchup is comprised mostly of sugar. It provides 8-10 grams or sugar per serving, no fat and no protein. Not to mention it has 0% of your daily value of everything but salt. It is essentially a worthless food item. Drop the ketchup to help drop the pounds. Artificial sweeteners, such as aspartame and Splenda, have no caloric value, but this doesn't mean that they don't help make you fat. Studies have shown that artificial sweeteners actually make the body crave sweets even more! When your body receives a sweet taste but isn't calorically satiated, it craves the real deal. If you are looking to kick a sweet habit, switching to diet sodas or artificial sweeteners might be a bad plan. Dining makes it difficult to keep your weight down. Most foods are cooked in butter or other fatty oils. Salads are often coated in dressing. 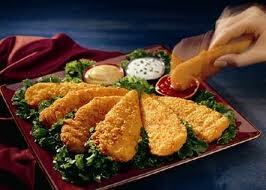 Many things are fried and breaded. 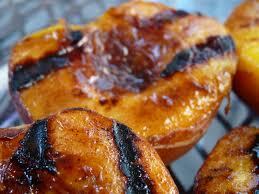 Even something as basic as a sweet potato is made into a dessert with butter and brown sugar. If you must dine out, make sure you are educated on how many calories are in these extras, and have your food cooked to order. I've talked to many people who think that if it is chicken, it is healthy. Chicken tenders are a staple on any restaurant menu. They are often one of the most -- if not the most -- calorie and fat-laden item. 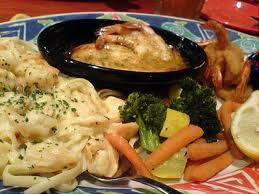 Add the strange orange dipping sauce that many places provide, and you have a disaster of a meal. 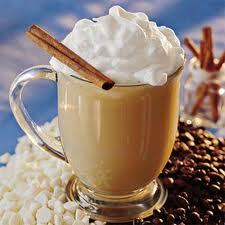 You triple-whipped, double cream, two-shots-of-vanilla venti latte is driving you down fat street. The iced white chocolate mocha from Starbucks weighs in at a whopping 500 calories. Dice all ingredients a few hours prior to serving. Place them in a bowl and refrigerate. The fruits will make their own juice, but you can also add a small amount of the Strawberry orange Vinaigrette just prior to serving for added flavor. Add almond slithers at time of serving. Parcook the potatoes: Place in a pot of water and boil until just fork-tender. Cool them down by dipping them in an ice bath [equal parts ice and water]. Once cool drain and slice each potato lengthwise into eighths. In a large bowl, whisk together the salt, lime, chili peppers, oil, garlic and cilantro. Add sweet potatoes and toss gently until wedges are coated with the mixture. Preheat a grill to medium; using a towel and tongs, wipe down the grill with grapeseed oil to prevent sticking. 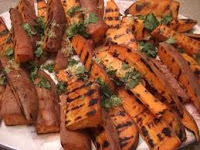 Place the potatoes on the grill and grill until golden brown on all sides, about 1½ minutes per side. Angelique: There's nothing like a pasta salad in the summer. Light. Yummy. Filling and Fattening. Joyce: Guilty as charged. When I was at Whole Foods they made some incredible pasta salads. The problem is they are not as healthy as we think. 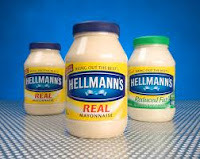 Angelique: The mayo and cheese, as good as they are, ruin any hope of the salads being healthy or low cal. Joyce: And another issue is that when you're buying food that is already prepared, you never know how fresh it really is. Angelique: But you do when you make it yourself. Plus you get to control all the ingredients. Joyce: Which means you can have your light, yummy, filling pasta salads and you're in control of its nutritional value. 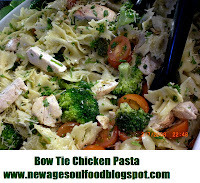 Angelique: This week, Mom's took the best of Whole Foods pasta salads and make them the New Age Soul Food way. Joyce: And for you vegetarians and vegans, all you have to do is eliminate the cheese and chicken like I do. Cook pasta until it‘s al dente. Drain, rinse in cold water until pasta is cool enough to handle. Transfer to a large bowl, add salt, mix thoroughly then place pasta in the refrigerator to complete the cooling process. Dice cheese into ½ inch cubes. Grill red peppers, remove seeds then julienne and chill. 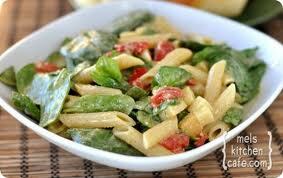 Add mozzarella cheese, peppers, spinach, parmesan cheese and parsley to the pasta and mix thoroughly. Whisk together the ingredients for the dressing until well combined. Add dressing to pasta and mix thoroughly, cover and refrigerated until ready to serve. Let chicken cool enough to handle then cut on the bias and refrigerate. Cook pasta until it is al dente. Transfer to a large bowl, add salt and pepper, mix thoroughly then place pasta in the refrigerator to complete the cooling process. Brush mushrooms with oil and grill. Let them cool than slice in to ½” strips. Grill scallions then cut them on the bias and set aside. In a large bowl combine the pasta, chicken, tomatoes, scallions, garlic, mushrooms and herbs and mix thoroughly. Add ½ of the balsamic vinaigrette dressing and refrigerate until salad is cold. Use the remaining dressing to toss on the salad just prior to serving. Sprinkle diced chicken with salt, pepper, granulated garlic and onion. Place in a baking dish and bake or grill until internal temperature reaches 165 degrees F.
Cook past until it is al dente. Roast garlic with a little olive oil salt and pepper on a grill or in the oven for 45 minutes or until soft. Blanch broccoli by boiling it in a pot of hot water for 2 minutes. Drain and cool it down in a bath of ice water, and set aside. Mix together the oil, vinegar, oregano, salt and pepper. Take the cooled chicken, pasta, broccoli, tomatoes, garlic, parsley and ½ the dressing toss together. Use additional dressing for individual plating. Angelique and I have purchased organic foods for 10 years now. There is so much controversy over organics vs conventional. You will just have to make your own decision; however, I began my quest for organic food after decades of working for a major agricultural manufacturer. I know what's in the food. I know the long term repercussions. I know that it is our job as consumers to do our homework and protect ourselves from the big business of the agricultural and food industries. 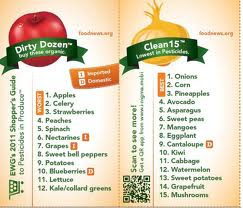 We follow the guidelines of the Dirty Dozen - Clean 15 Chart. It is a list of foods with the highest and least amount of pesticide residual. Everything on the dirty dozen list we buy organic, and when in doubt, we buy organic. Anything that is animal or a derivative of, we purchase organic. Whatever path you choose to follow, your best bet is to purchase locally grown produce whenever possible. It is fresher and more nutritious than produce that has traveled cross country or world. Here is a finder for your local Farmers Market. Let me add that eating Organic is not the easiest endeavor, but it does limit your exposure to deadly pesticides that over time can cause disease. With that in mind, it really is well worth the effort. Soulful Eating and Stay Healthy! The following is an article that will explain everything you need to know about organics. Organic food is food that is grown without the use of synthetic fertilizers, chemical pesticides and insecticides, growth hormones or antibiotics. Organic food cannot be irradiated, contain genetically engineered organisms (GEOs) or genetically modified organisms (GMOs), and cannot be grown using sewage sludge fertilizer. Yes. 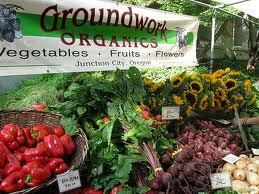 Organic farmers practice crop rotation. This means that they will grow different crops each year to preserve and nourish the soil, and to promote biodiversity. Traditional farmers may grow the same crops on the same soil year after year and use toxic chemicals, both of which result in nutrient depletion. The nutritional value of food is strongly correlated to the nutritional value of the soil. It is all about the soil. Why does organic food cost more than conventionally-grown food? This is due to a variety of reasons including: major agribusinesses receive large subsidies from the government, particularly for corn-based products; most organic farmers do not have the economies scale to compete with large corporate conglomerates, and; organic food producers must go through go through a rigorous and time-consuming process to receive organic certification. Even though conventional food may cost less, it does not deliver the same amount of mineral nutrition. The cost may be lower but so is the nutritional value. Why does organic food not last as long as conventionally-grown food? This is because organic food does not contain artificial preservatives to extend its shelf life. Having these preservatives results in an inferior taste. If I am new to organic, do I have to eat absolutely everything that is organic? Switching to a 100% organic diet Day 1 is simply not realistic for most people. If you are new to organic, below are a few different suggestions on how to get started. Go into the market and look for products with the USDA Organic Seal — see below. If you have kids, buy organic milk and organic cereal. Substitute your regular soda with organic soda or organic juices. If you are not a vegetarian, buy organic chicken instead of regular chicken. Start off slowly, don’t buy too much at first and see what products work well for you. Also, you will need to understand the short shelf-life of organic fruits and vegetables so you don’t waste any food or money. Here is a video that I put together that explains how we know if something is organic or not. What are the different categories of organic? This means that 100% of all ingredients in a product (except salt) and water, are organic. 100% certified organic products may use the USDA Organic Seal. This means that 95% of all ingredients in a product, except salt and water, are organic. Certified organic products may use the USDA Organic Seal. This means that 70% of all ingredients in a product, except salt and water, are organic. These products may not use the USDA Organic Seal. What is the history of organic food regulation in the U.S.? 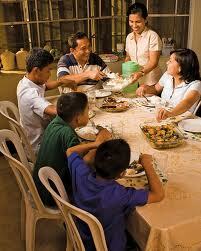 It largely began with the passage of the Organic Foods Production Act of 1990 (OFPA). This bill mandated for the creation of an advisory board, the National Organic Standards Board (NOSB), to write recommendations for the standards of organic food. It took 12 years for the government to approve the exact wording of these standards and establish criteria for which foods could call themselves “USDA Certified Organic”. Here are a few studies that talk about the nutritional advantages of organic food. How do I know the food I am eating is organic? Organic food is certified by an independent, third-party certification agency. The USDA’s National Organic Program (NOP) approves organizations, both for-profit and not-for-profit, that wish to be official certification agencies. Food processors and manufacturers are held to the same standards as farmers. Inspections take place at least once per year. There are many small farmers who practice organic farming but do not participate in the certification process because the cost and time expenses are too onerous. Therefore, they are not legally allowed to call their food organic. An organic food product lists the certification agency on its label. The largest agency is Quality Assurance International. What is the difference between organic and natural? Natural products are supposed to contain no artificial ingredients or added colors and be minimally processed. Natural products do not have near the regulation, standards or enforcement as do organic products. Overall, there is a lot of widespread abuse of the word “natural”, and there is tremendous confusion about what the word means and the value it provides. Berbere Spice to taste – Make your own or find it in Ethnic Markets. Sprinkle or coat the fillets with berbere spice on all sides. Amount depends on how spicy you want the fish. Let them marinate 1 hour on the counter or overnight in the refrigerator. Heat grill to high, brush grates with canola oil. 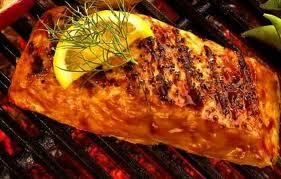 Place salmon fillets on grill. Once you place it on the grill do not move it for at least 4 minutes. The fillet needs time to release itself from the grate. Grill for 4 - 6 minutes per side (depending on the thickness). And remember, it's better to undercook than overcook. Cut bok choy in half lengthwise, wash and set aside to drain. Heat oil and briefly sauté ginger, garlic and crush red peppers. Set aside to cool. Add tamari to a large bowl and whisk in the cool oil and ginger combination. Add bok choy to bowl and mix by hand to make sure each piece is covered with mixture. 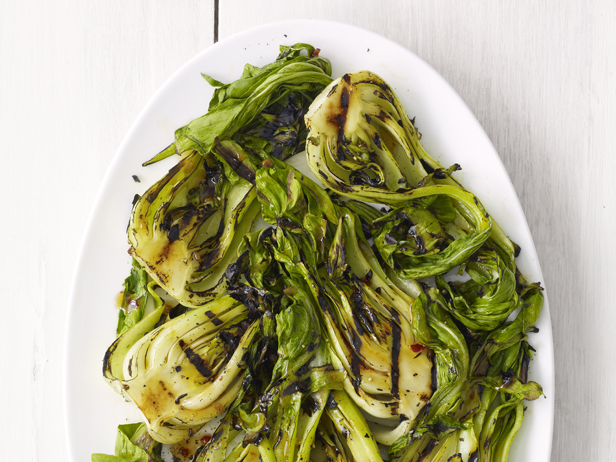 Wipe the grate down with canola oil and place the bok choy directly on the grill. 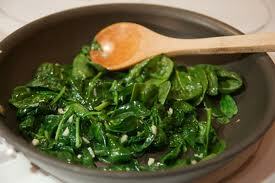 Turn the bok choy often, brushing on more sauce as needed. 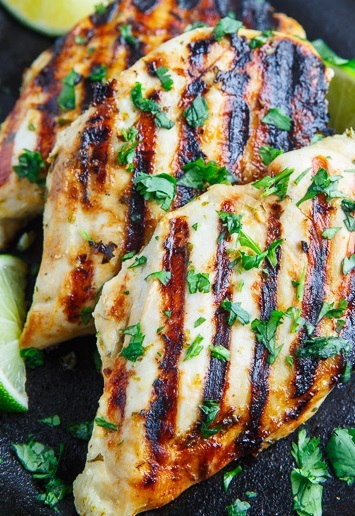 Remove from grill when they can be easily pierced with a fork. In a saucepan over medium heat, stir together vinegar, maple syrup and pepper. Simmer until liquid has reduced by one half. It should become slightly thicker. Remove from heat, and set aside. Lightly oil the grill grate. Place peaches on the grill, cut side down. Cook for 5 minutes, or until the flesh is caramelized. Turn peaches over. Brush the top sides with the balsamic glaze, and cook for another 2 to 3 minutes. Transfer the peach halves to individual serving dishes, and drizzle with remaining glaze. Add juice of 1 lime, rice and 1 teaspoon of sea salt let water come back up to a boil again and cover. Lower heat to a simmer and cook for 30 minutes or according to package directions. 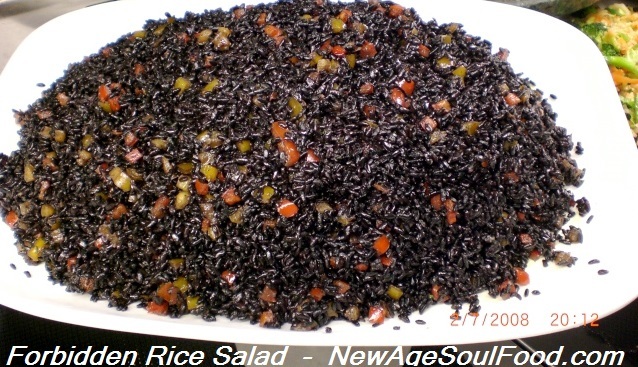 Let rice sit while you whisk together the ingredients for the dressing. While rice is still warm toss in the sesame oil and tamari mixture. Let cool, then add mint, basil, cilantro, parsley, red peppers, yellow peppers, jalapeno peppers onions, pine nuts and pepper to taste.